Hi. Please forgive me if this request has been raised before. 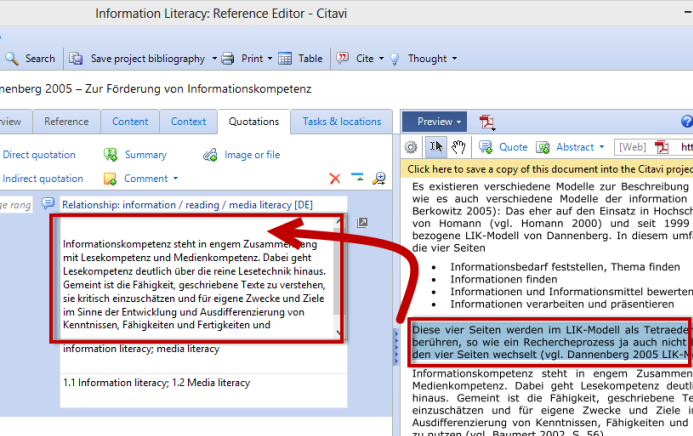 When I'm in the middle of creating a knowledge Item, such as a comment or a summary, I often need to highlight a section of text in a PDF file open in the preview pane in order to copy it into the knowledge item. Unfortunately, when I do this the knowledge item window disappears. Would it be possible to keep the knowledge window visible in some way, perhaps making it semi-transparent, so that I don't have to hunt around for it beneath the top window to paste in my text. Thanks very much for your suggestion! If you're copying text directly from a PDF, it sounds like you would want to save this text as a Direct quotation rather than as a comment or summary. However, I do see your point about the disappearing window. In the Publication Assistant we have a Float button, and it might make sense to have something similar here. I'll add this to our wish list for new features but can't promise that it will actually be developed. Thanks for your speedy reply and putting my suggestion on the list for new features. I really appreciate your remarks regarding Citavi 4 too. Thank you very much. As regards the knowledge item window, even though I may be writing a Comments so should not need to copy text over, often I like to paste in direct quotes into the comments window because they are reflections on, or analyses of, a particular section of text.